This is the E-pattern version of Wearing History's Smooth Sailing Sports Togs pattern. 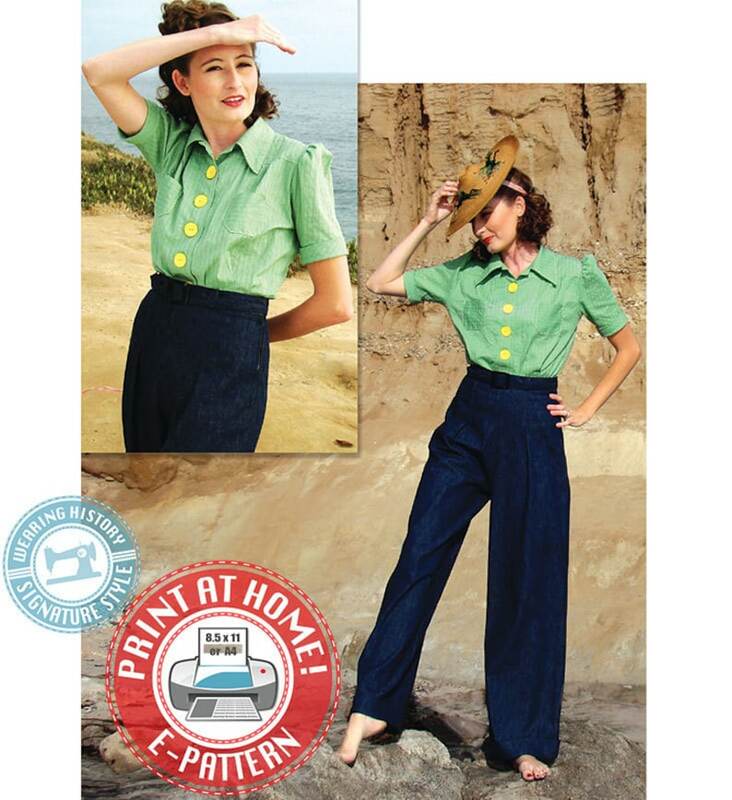 Our best selling pattern is the perfect casual vintage ensemble- for dancing, wearing about town, and anywhere you want to take them- tailored enough to be dressy but casual enough to go anywhere! These trousers and blouse were inspired by the mid to late 1930s. It works well for looks from 1935 to 1941, but can look just as chic when mixed in with modern basics. The yoked blouse has short puffed sleeves cut on the straight of grain and cuffs that are cut on the bias. It has a self facing and buttons up the front. It provides the perfect background for fun buttons, and the cut is fitted at the waist but loose at top. It’s perfect for prints or solids! The front can be buttoned all the way up to the neck or the top buttons can be left off to make a notched collar. This pattern was inspired by original mid 1930s patterns but has been based on a vintage blocks. The trousers are updated and redrafted for an improved fit. The blouse is close to the original mid 1930s source material, with improvements for fit and versatility. This pattern includes easy to understand pattern markings, and brand new step-by-step illustrated instructions. 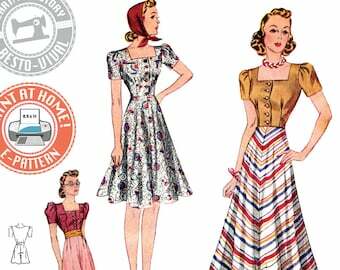 This pattern also includes cutting layouts for 45″ and 60″ fabric, and a yardage chart and supply list. The pattern is printed on good quality bond paper. This pattern comes all neatly packaged in a clear resealable plastic bag so you can keep your pieces, instructions, and you can add your own fabric swatch and inspiration photos so they can be kept in one handy little packet! This pattern is recommended for intermediate sewers. A basic knowledge of sewing terminology and zipper application is expected. *Please note* that I have heard back from customers that this runs very small in the bicep of the sleeve and cuff, and some say it runs small in the armscye. A muslin mock up is highly suggested to fit the pattern before cutting into your fashion fabric. Please read the reviews below that cusomers have graciously left of their experiences using this pattern for more feedback. This pattern is formatted for USA Letter Size and A4 sized paper. You will need to print this pattern to 100% scale. Open the “READ-ME-FIRST” File for instructions on printing and piecing your pattern. This pattern fits US Letter or A4 sized paper. You will print these documents on your home printer, cut off the border, and tape them together to form a larger pattern layout. Then you cut and use your pattern just as you would a normal home sewing pattern. Have made two pairs of the trousers so far. I just 🖤 them. Currently cutting out this pattern! I'm sooo excited. I hope it looks as cute on me as it does you! great and easy pattern to print and get together. looking forward to sew it. thx.